Five hundred years after they were first produced in this Nara Prefecture town, Takayama chasen remain the tea master’s whisk of choice. 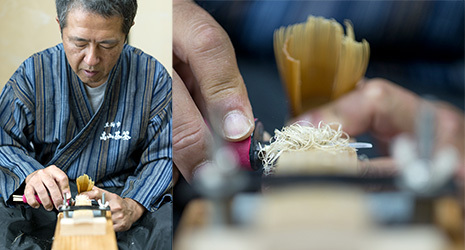 A brittle cracking sound fills the tatami-matted room as Kyosuke Kubo uses a chisel to make incisions in a 12-cm length of blanched bamboo. In the hands of a novice, the result would be a splintered mess, but after thirty-six years in the trade, Kubo’s technical precision is near-mechanical. Each cut is made with two controlled thumps using the palm of his hand on the chisel’s handle. Within a matter of seconds, Kubo has divided up the bamboo into sixteen equally sized tines. He repeats the process for each piece of bamboo, sharp inhalations punctuating the blows, which themselves are finely adjusted to allow for differences in wood texture and density that are imperceivable to the layman’s eye. Takayama became a major production center of chasen and other tea implements around 500 years ago during the Muromachi period (1336–1573), which saw a flourishing of so-called Higashiyama Culture, of which the tea ceremony was a key component. 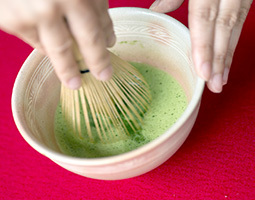 The first whisks are said to have been made by Takayama Minbunojo Nyudo Sosetsu, the second son of the lord of Takayama Castle, at the behest of close friend Shuko Murata, the head priest at Nara’s Shoumyou-ji temple, who is widely credited as being the founder of the “wabi-cha” style of tea ceremony and the inventor of powdered tea. The lord of the castle subsequently entrusted the manufacturing of his son’s fine whisks to his vassals, who were bound to secrecy about the crafting process and would work through the night having completed their daytime duties. At the time, there were fifty workshops in Takayama employing hundreds of craftsmen and other staff. The industry grew to the extent that the small community became quite affluent and even had its own bank, Kubo says. A plethora of imports has affected the industry however, reducing the number of workshops to eighteen today. Each craftsman in Takayama produces about ten chasen per day, with the major production processes being divided up between multiple skilled workers. The first of those processes involves the winter harvest of 2- to 3-year-old lengths of the hachiku varietal of bamboo, which Kubo says possesses a straight and supple fiber. 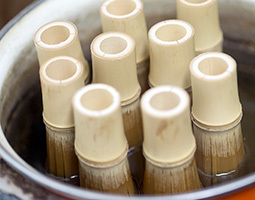 These are boiled to remove natural oils, and then dried and stored for two years — a process that blanches the bamboo and toughens its outer layer. The bamboo is then cut into 12-cm lengths, which are in turn cut to produce the sixteen tines in a process known as “hegi.” Each tine is next split into ten thinner prongs, half of which are slightly thinner than the rest and will serve as the outer prongs of the whisk, while the remainder are bound to create its inner core. The tips of the outer prongs are then shaved to a thickness of approximately 0.05 mm, which Kubo determines by a certain translucency that emerges after each stroke of the knife. “This process is called ‘aji-kezuri’ (taste shaving), as it is these finely shaved tips that most affect the taste of the tea,” Kubo explains. Finally, tiny fragments are removed from the surface of the tines, whose tips are curled inwards by drawing them rapidly under pressure between thumb and a small spatula. Each of Japan’s tea ceremony schools uses a different type of chasen, distinguished by the color, length and thickness of bamboo used, and the size and number of the tines.